Take a moment to think about how many times a day you use language to convey your thoughts, needs, feelings and wishes. Now try to imagine how you would communicate those ideas without verbal language. It's not something I thought a lot about until I had a child with special needs. Shortly after his birth, we were told that Aaron had suffered a brain injury that would result in severe cerebral palsy and severe mental retardation, and given his prognosis we never expected to be able to meaningfully converse with him. Today, Aaron is eight, and although he is functionally non-verbal he does have a couple of words that he uses at times. But something we are even more excited about is his ability to finally utilize some of the learning disability assistive technology devices and methods that we began training him for as an infant. Advances in the field of assistive technology and Alternative Augmentative Communication have given us a window into Aaron's mind, allowing us to see what he is capable of and what his interests truly are. And they allow him to express himself, make choices, and develop a sense of autonomy and independence that would otherwise be impossible for him. One of the first lessons we learned after getting involved with an assistive technology consultant was the difference between a low-tech versus high-tech means of alternative communication. Low-tech methods involve no complicated equipment and can be devised at home using objects you already own. High-tech methods involve communication devices, switches to accommodate for physical limitations or other equipment that is more complicated and often quite expensive. When introducing your child to assistive technology, it is general practice to start with low-tech methods to assess his or her ability to understand and practice alternative communication. After progress is made with the low-tech methods you can then explore more high-tech options with an assistive technology consultant or speech therapist to decide the next step for your child. Because Aaron had profound physical limitations due to cerebral palsy, our first goal was to determine whether he would be able to manipulate a switch and because his cognitive limitations were unknown as a non-verbal infant, we had to see if he would connect the act of him touching a switch with the sounds the communication device would make. To test these abilities, we began with a Step-By-Step Communicator, pictured to the right. It is a voice output device, which means that it would only "say" a pre-recorded message when Aaron hit the button on the machine. To begin, we recorded simple messages, such as saying "hello." We quickly learned that he was capable of both using the switch and understanding that pressing the button would result in a sound coming out of the machine. From there, we progressed to more complicated associations, such as recording, "More please!" to use during feeding times for when he wanted another bite. Using the Step-By-Step for situations such as meals allowed Aaron to have some control over his environment for the very first time, and was extremely helpful in building his interest, confidence and willingness to explore more advanced communication options. After his success with the Step-By-Step, we progressed to making choices. We started with a low-tech method of communication, making a card with a happy face picture and the word "yes" underneath and a card with a sad face picture and the word "no" written on it. We spent countless therapy sessions introducing him to these images and attempting to demonstrate what they meant. In time, Aaron progressed to a point where we could show him the cards, put one on each side of his field of vision and ask a question directing him to answer "yes" or "no" by looking at the appropriate card. It took a fairly long time to determine whether his answers were really his or just our interpretations of his movement, and when we were confident that he was actively making choices on his own, we started presenting him with choices whenever possible. He now makes choices between two presented options at home, at school, at restaurants and in a variety of other settings. Because the ability to answer with a "yes" or a "no" was so important, we used those cards to teach him to use his eyes to answer when the cards were not immediately available. After a lot of hard work, Aaron now answers "yes" by looking up with his eyes and "no" by looking off to the side. This ability has helped us all tremendously. Now that he can tell us what he wants or if something is wrong with his eyes, Aaron experiences less frustration and has fewer temper tantrums. The ability to answer "yes" or "no" and the ability to make choices are amazing, and all due to a low-tech method of assistive technology requiring only a couple of index cards and some pictures. After Aaron demonstrated that he could accurately make choices between two options using pictures or the objects themselves, it was time for the next step. 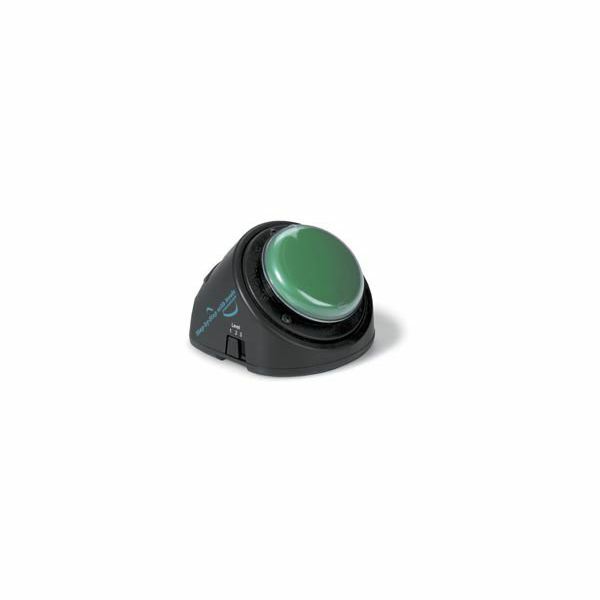 For him, that meant teaching him to use a voice output device that provided multiple options. 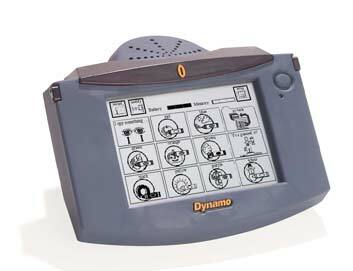 The device that his therapists decided was most appropriate for him was the Dynamo made by Dynavox Technologies. 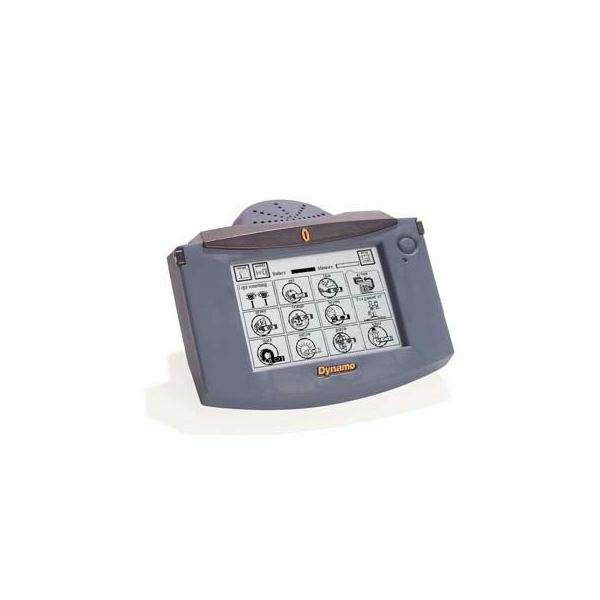 This device can be used in a visual or auditory scan format. The visual scan format uses pictures and after a question is asked by a therapist, the images scroll through on the screen. When Aaron saw the picture that matched the answer he wished to give, he would press a button and the Dynamo would "say" the answer for him. Due to physical limitations and uncertainty about his visual skills, it was decided that an auditory scan system would be more appropriate for Aaron. To use the device, he wears a set of headphones and the therapist asks a question. His options then play through the headphones and when he hears the answer he wishes to give, he presses the button and the Dynamo "says" the words he can't yet say for himself. It's pretty amazing to hear your non-verbal child "talk," even if it is through a machine! Given Aaron's success with his Dynamo, there are so many exciting options for his communication skills in the future. There are more advanced versions of the Dynamo that can allow Aaron to "say" something completely original and not just his choice from a list of presented options. There are machines that use eye gaze or infrared technology to operate if manipulating a device is beyond his level of fine motor function. There are creative mounting options that can allow him to have his communication device with him in an unobtrusive manner wherever he goes. Our family's journey with Aaron's communicative abilities involved low-tech methods of alternative communication, a Step-By-Step, and now a Dynamo but the possibilities and options for children with different abilities are almost endless. Children with learning disabilities and a wide variety of special needs have a lot to say, and thanks to advances in the field of learning disability assistive technology the rest of us are able to finally hear them.